Thursday: I begin every day checking my email. Today I get an order from my website for a tapestry bag, a necklace, and a fish print. I haven’t made the bag yet (I’m sold out after Christmas) so have offered to make it to spec and am waiting for a phone call. This client said she’d read my entire blog, including my breast cancer blog, and said she was moved by it. This is a wonderful way to start a day. I spend a pleasant hour sorting a big bead order I recently bought on-line. 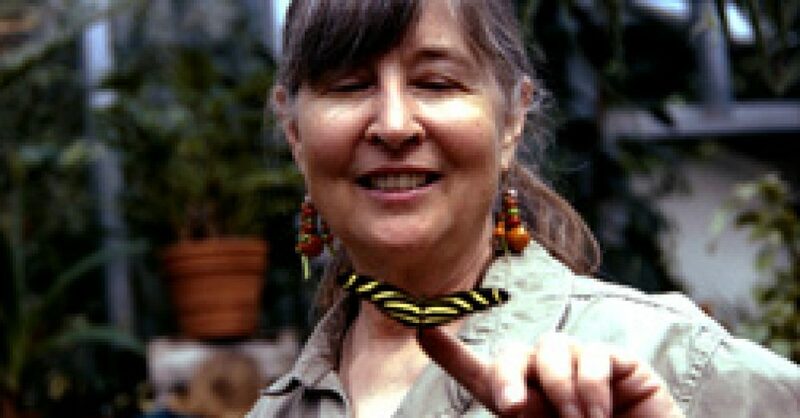 I like sorting beads…I get to know what’s there and it has a meditation effect. Around 10 a.m. I stop by the Mary Blocksma Gallery in the Gypsies building to hang my newest painting (Parrot Girl) in the coffee shop with sign I’d made on Word and printed out to go with it, check my mail, water the plants, and buy an oatmeal cookie from Jack, whose deli shares space with the coffee shop in front of the building. Next I drop by the newspaper office to pick up a contract I’ve been negotiating for over a month with our local newspaper: I am proposing to write and illustrate a weekly column called “Nature in the Neighborhood.” I want to keep my rights and get paid too, so the problem was sent to the attorney’s office, a wormhole into which things apparently vanish for a very long time and emerge in a very different shape. I still am uneasy about the rights business, so I spend a great deal of Wednesday rewriting the contract so I can keep more of my them, although not all. I drop a copy off at the paper at about 3 p.m.
By 4 p.m. I on my way to Saginaw to order two very big mats, as they are having a 50% off custom framing sale at JoAnn’s. Anyone who has had anything framed lately knows how expensive it is, so I do my own framing, buying especially large frames from yard sales and thrift shops and ordering the mats when the sales are on. While I’m there I pick up card stock from Sam’s Club, which is the only place I can find heavy enough stock with a glossy enough finish to print notecards. I am not home long before a friend comes over unexpectly who has already seen Parrot Girl in the coffee shop. He wants to commission a portrait of his beloved holding a bird something in the manner described in a poem he has written about her. I agree to this if he’ll agree to my minimum commission charge of $300. He will think about it. That evening, after a beer with another friend at a local watering hole, I work on a full-length acrylic-on-illustration-board portrait of a particular beautiful friend. I’ve done everything by the hair and the background–the basic layer, that is–but I can’t do the hair until I decide on the background. I try blue-green and hate it. I go over that with a springier green that I like better with her pink gown. Friday: My website client calls and we decide on bag details and I take her order. I spend two hours making the bag, beading the strap, and packaging everything up. Suddenly I realize I haven’t paid my credit card bill and panic that I’m late and my interest rates will triple. I’m right–I’m two days late. I spend the next thirty minutes on the phone trying to rectify the situation and then another thirty minutes figuring out how to pay the bill on-line and hope that my damage control was sufficient. 1) I realize that I really don’t want to give up ANY rights on my column, so I go on-line and google some things like self-syndication and I find out that I can ask about half the price I was asking if I syndicate. I don’t mind giving up half the price to keep all the rights, so I call the editor and suggest this on his voice mail. He calls back later in the day and says it sounds fine but he has to check it out with the attorney. Back to the wormhole. Meanwhile, I will have to come up with my own contract but can’t find a sample on-line so I’ve ordered two books, one from half.com and one from the library, and although I’ve written the first column and done the art, the whole thing is on hold until a) I hear from the attorney and 2) I figure out how to write a self-syndication contract. Persistence is what wins out here. It takes a lot of patience to see a new project through to the end, but it’s all possible with patience and tenacity. 2) I suddenly realize that Valentine’s Day is nearly upon us and I have nothing in my gallery that is remotely relevant except a few pink rose cards. I spend a couple hours designing a couple of valentines, one from a painting I did some years ago of a red rose and another from a red heart that I paint with brilliant Dr. Martin watercolors. I scan it and plan it, print it, cut the cards on the paper cutter, fold them, package a couple dozen of them in little clear envelopes. Next I roll twenty Bay City posters to restock my nearly empty supply at the gallery. Finally, around noon, I get to the gallery with a stack of cards and a bundle of rolled posters. I order Jack’s oatmeal for lunch. Yum. 3) After a nap, I am plagued by worries about my book, What’s in the Woods, for which I have done a couple hundred small watercolors, but which I’ve been blocked on for about a year. I decide to jump in and solve the problems. I work until 10 p.m. redoing the outline and simplifying the book to be a clue-book to identification, taking out a lot of the education stuff that was cluttering it up and bothering me. I did a new storyboard for the entire 48-page book while I “watched” the opening ceremonies of the Olympics. 1) I take out all the art for What’s in the Woods and realize that I have a show here. 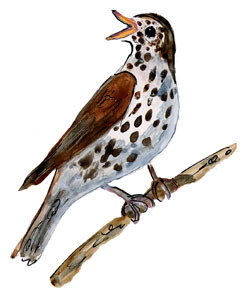 I have been planning to do Spring Show at my gallery with at least 15 new paintings (I’ve done five so far this year), but I realize that I could frame up these wonderful little watercolor studies (the Wood Thrush is one of three images on one of the studies) and, if I had the book printed by then, I’d have a really incredible show and booksigning combined. I decide to try for early June for my show, book and all. 2) I spend most of the day working out the first spread: the book design, how I will set it up. This one involves big bright winter birds. I work for hours to find a way to hand-write the captions and notations to look more friendly than type. Handwriting is hard to scan but I’ve decided to set everything up on PhotoShop instead of InDesign, using the layers to move things and add the captions. I am pleased with the results and am ready to really hit it, now that I’ve set up the format, which is the hardest part. Fortunately, I learned all the layout programs when I did What’s on the Beach? so at least I don’t have to learn a complicated new layout program. 3) I spend an hour and a half writing this blog entry. I forgot to mention that I spent time working on this website Thursday and Friday too, adding blog news and doing other webmaster chores. Now I have to get to the post office and the gallery before they close. 4) I thought my work day was over but it’s not…I returned from the post office with a Netflix movie to find an email from one of my wholesale clients. I don’t get many winter orders from galleries, gift and book shops that carry my work…there are about fifty of them now. I work all winter to have something new for summer. Over the years I’ve become very fond of some of these people who have supported me, some since the beginning of my art career about seven or eight years ago, and I always like getting mid-winter news. When I paint using photographs, it’s obviously important that the painting be a lot better than the photograph, and it’s always been pretty easy to do that. It was harder this time, because this new camera is so good and I set the composition up on PhotoShop, combining three or four photographs, picking out interesting shapes, making sure I had the wonderful age range represented that really is there. I like the result…it’s pretty much what I’ve been carrying around in my head: the fabulous, almost silhouetted shapes at the top of a white hill against a white sky. It can only be Bay City because you can see the lights tower that presides over the softball field on the right. I also made sure to put in the pigeons that frequently perch in rows along the bridge lights. I’ve waited years, but finally we got a huge fluffy white snow on a Friday night, so Saturday at ten a.m. our riverside park was joyful with color against a still-pristine white. Bay City Snow Day is acrylic on acid-free illustration board, and measures 36 by 15 inches. Click on the image to enlarge it. I’ve talked to other cancer survivors, and we all seem to feel as if we got handed a Get Out Of Jail Free card with a clean lab report, which frees us until about a month before our next scheduled test. For me, this means that I’m free until about the middle of May, when a subteranean anxiety will start tunnelling upward, reaching full force between the test time and results. Many mammogram facilities these days recognize this anxious time and will give the results on the spot, but mine has not progressed to that point and I have to wait about three days. That’s better than it used to be. There is more to worry about for me than a breast cancer recurrence. The treatments–Arimidex (which I no longer take due to excruciating side effects) and perhaps radiation–have resulted in something called osteopenia, a precursor to osteoporosis. Like most other survivors, I have to deal with side effects for big meds, which I don’t seem to tolerate very well. In fact, I tolerate them so badly that I have opted to park my hopes on a positive attitude, daily exercise program (which one doc says won’t affect recurrance at all), diet (same doc says that fat makes estrogen which feeds my kind of cancer cells, so maybe lose weight? ), and just being happy with each day of my life that I feel reasonably good. Meanwhile, my projects are doing well: The Mary Blocksma Gallery is going far better than I expected, although I confess that my expectations were not high. Also, I’m waiting for the Bay City Times to come up with a contract that reflects our agreement that I do a weekly nature column. That is an exciting possibility. And I am painting again. And I’m taking photos. 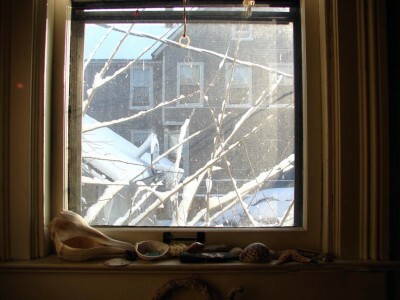 This one is the view from my bathroom window on an early sunny Saturday morning sparkling with new snow. Blocksma’s gallery as prints and notecards. books. One quilt, called “Summertime,” even celebrates fish. Coming soon! The MARY BLOCKSMA GALLERY! I am so excited about this new gallery. I returned from Costa Rica with a lot of energy, and I’ve spent it as if I’d won the lottery. I’m already exhausted getting ready to open: packaging prints, notecards, and original paintings, labelling, framing, planning. My friends John Lucas and Judy Prahl have been helping me hang it all up on the high long walls and little nooks. My gallery inhabits a space in the new delicious orange Gypsies Cafe building at 510 Third Street in Bay City. Enter through the fragrant coffee shop, order the best sandwich in town from Jack’s deli, enjoy one of Maryanna’s coffee creations, and/or wander through the spirited gypsy shop to my gallery at the back. Showing for the first time will be more than thirty pieces of art I produced during 2005, some of it during or in response to my treatments for breast cancer. I will be on the next Bay City Gallery Walk, even if things aren’t finished, held the first Thursday of every month. The next one will be November 3rd, from 5 to 8 p.m., at which time the downtown galleries in Bay City host parties, sometimes with wine and food. 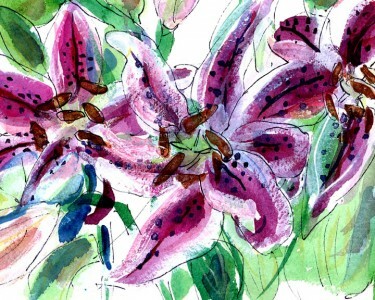 The lily watercolor is taken from my Costa Rica sketchbook. Click on the image to enlarge it.